Happy March everyone! I am so excited to finally be on our way to Spring (at least here in MT), it was a chilly -20º to -40º last month. The sunshine feels it has been away for so long and I am ready for the freshly birthed energies that come with the season. March always has a special place in my heart as I am a true Spring Ram, born on the 23rd! Today I am back with a new edition to my DIY Reusable Series with Guayaki, taking a whole new approach to reusing every aspect possible. A few months back on a whim Kal and I got crafty and made some tea light candles using some recycled wax from bigger candles and nothing other than Guayaki's Terere Glass Bottle lids! They were totally a trial thing that I really didn't think would work that well, but to our surprise the little yellow tea lights burned slow and wonderful, making our space even cozier. 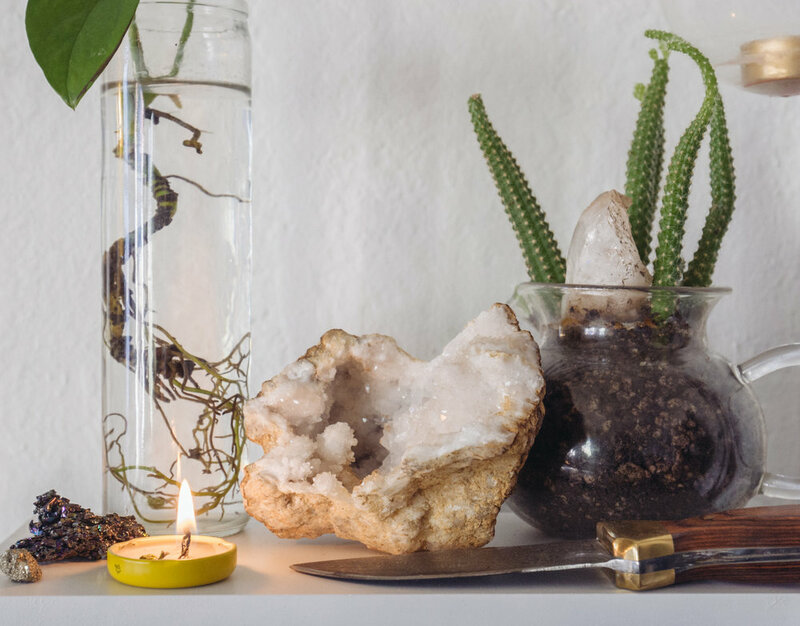 As a tea light candle hoarder I was getting sick of the waste associated with buying them in bulk every month, and just when I needed it most this beautiful idea came to fruition. 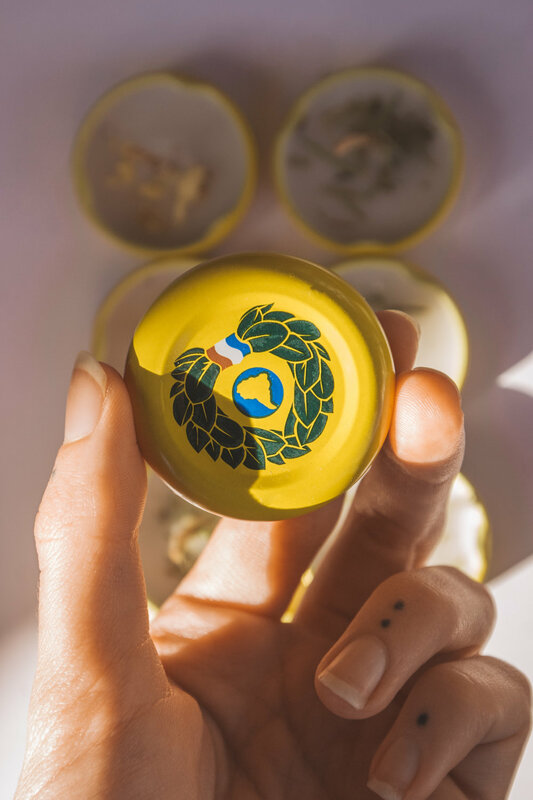 The best part is you can reuse the lids over and over to help supply your own stash of eco-friendly tea light candles (bonus points if you use recycled wax from bigger candles). 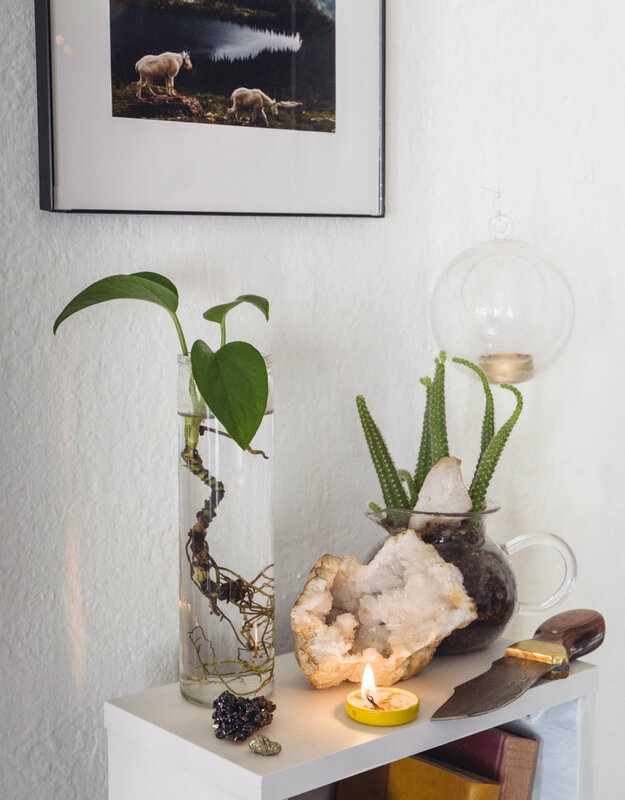 This project takes a bit of patience and steady hands but after a little practice you'll be concocting up your own unique candles. 1. Prep Your Candle Bases- This step is much easier if you have pre-made candle wicks with bases on the bottom. I did not have access to bulk candle wicks at the time, so we experimented with short (1 inch) twine cuttings that take a little more time + effort but worked great. If you have pre-made wicks set it in the center of the cap and stand it up straight. If you use twine there are probably several methods you could use to make this work, but I chose chopsticks, a small clothespin and tape to hold the twine up in the center across rows of the caps. Experiment with what you have- they don't need to be perfect. 2. Melting The Wax- Gather your wax and shave it into small pieces and put inside the glass measuring cup. Fill your medium pot a little less than halfway with water and bring it a boil. Set the measuring cup filled with wax into the water by resting the handle of the glass cup over the edge of the pot to create a double boiler effect. Stir the wax periodically and add essential oils of your choice. I used peppermint + rosemary for this batch. 3. Pouring The Wax Into The Caps- Once the wax is melted, carefully pull out the glass measuring cup (the handle shouldn't be hot, just watch the sides of the pot) and turn off the boiling water. Slowly fill each cap to the brim with the wax. If you are using the pre-made wicks you may need to gently hold each one in place as you pour. 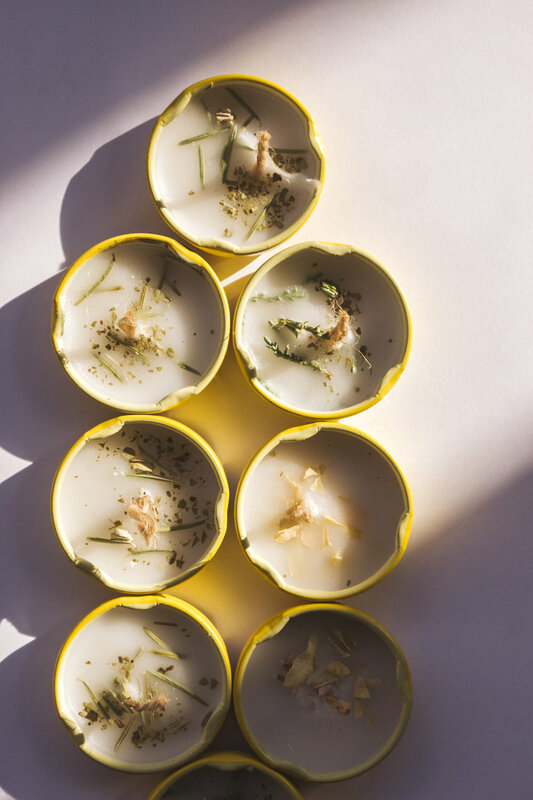 Set aside the measuring cup and garnish the tops of each candle with herbs of choice. I used some loose leaf Yerba Mate, Juniper, yellow flower petals, and pine needles. 4. Final Touches- Allow the wax to completely cool and harden before detaching the twine wicks from the chop stick and tape. If you used pre-made wicks or successfully cleared the twine cut the size down to as short as you think fits. Now all you have to do is burn, enjoy, and repeat! Make sure to never leave the candles burning in an unoccupied room and keep them a distance away from flammable materials. 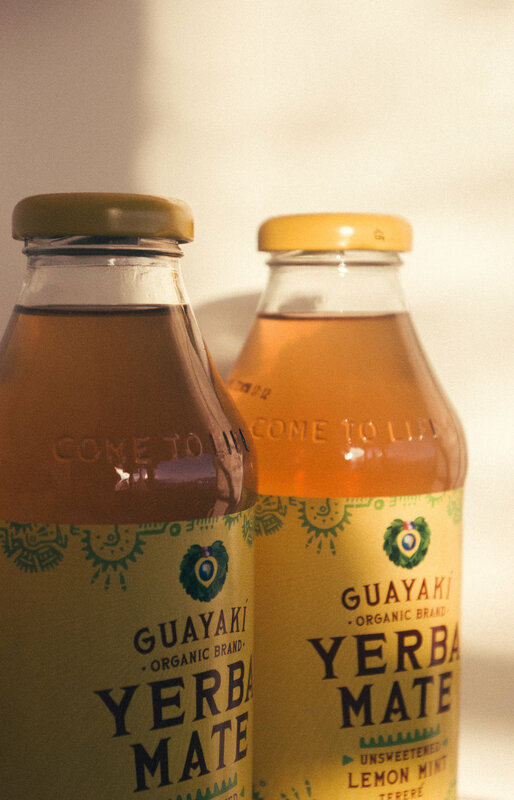 Get your Guayaki fix at most local health food grocers and online here to start making your own!